Maloslos City—Since 8 p.m. Thursday evening, a mayoral candidate and former vice mayor of Marilao town has been in a standoff with arresting police officers. 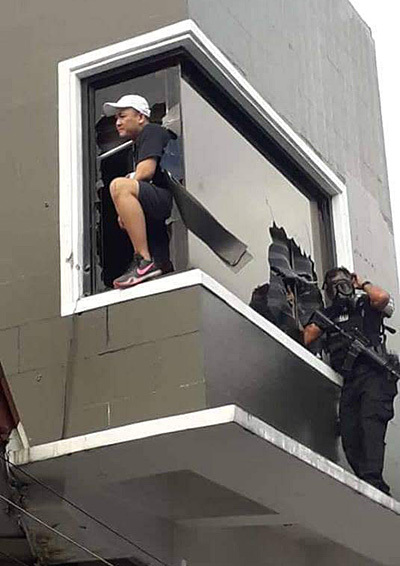 Andre Santos, single, and in his early 30s, has warded off cops armed with a non-bailable warrant of arrest for estafa by threatening to shoot them and explode a handgrenade. Senior Supt. Chito Bersaluna, provincial police director of Bulacan, said Santos has a warrant for qualified theft issued by Judge Aida Estrella Macapagal Fojas of RTC Branch 195 in Parañaque City. Bersaluna said Santos was armed with an automatic handgun and a pink-colored grenade and said to be emotionally disturbed and has been using illegal drugs. At past 3 p.m. Friday, police negotiators led by Marilao police chief, Supt. Ricardo Pangan were joined by provincial officials to secure Santos’ surrender but the former vice mayor held his ground inside their residence in Barangay Poblacion. Santos had several video posts in Facebook mocking cops out to serve the warrants. Santos was defiant in his first post and challenged cops to get him because he has no plans of surrendering. For more than 20 hours, Santos bought time in a tense negotiation with authorities through Facebook. However, police gave an ultimatum at 4 p.m. yesterday and cut the electricity at the residence before barging in to forcibly arrest the suspect. Santos was subdued after he tried to break open the glass windows at the 2nd floor of their house. A SWAT team armed with teargas, however, overpowered him when he tried to run upstairs. Santos allegedly swindled Charlie ‘Atong’ Ang, his brother-in-law and partner in a casino lending business of some P10-Million. Earlier, mayoralty candidate Jemina Sy urged Marileños to refrain from passing thru Sandico Street where the standoff is happening to prevent them from possible danger.